News of the Wright Brothers Flyer spread rapidly, and soon many other aviation pioneers were building their own flying machines. In August 1909, twenty-two of them met at a racetrack outside Reims, France to compete in the first organized international air meet. 38 planes arrived, but only 23 actually flew in the meet. The pilots completed 87 flights. The Reims Air Meet proved the viability of flying. David Lloyd George, the future prime minister of Great Britain, remarked, "Flying machines are no longer toys and dreams. They are an established fact". The Reims Air Meet was one of the most important events in aviation history. It dramatically legitimized the importance and significance of flight. It prompted rapid innovation, civil aviation, air mail service, and motivated many nations to establish an air force. Only five years later, pilots were dogfighting in the skies over Europe during WW I. This poster shows all of the planes that flew at the meet. A few important contemporary flying machines did not participate. These included Edwin Roe�s triplane that incorporated the first aircraft control column, and Hans Grade�s monoplane, the first German aircraft. 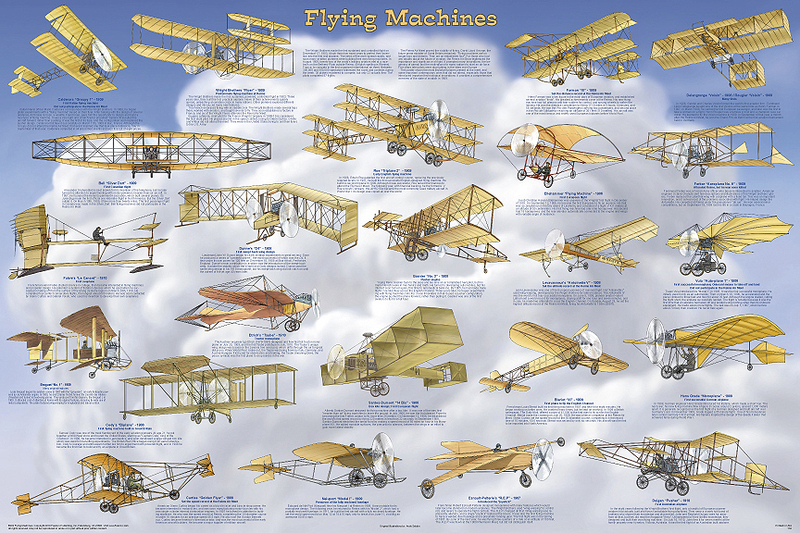 These are also shown so that the poster provides a comprehensive overview of aviation in its infancy. Standard poster is large 24" x 36" size that fits standard frames. Printed on heavy, acid-free paper using non-fade inks, then coated to provide satin finish and provide protection from UV rays and scratching. Laminated poster is our standard poster totally encapsulated in heavy 3 mil plastic for long, long life.